QINGDAO, May 28 (Xinhua) — Researchers Monday expanded the testing of rice growing with saline-alkali soil across China to choose breeds with quality and optimum yield.According to Zhang Guodong, deputy director of Qingdao’s saline-alkali tolerant rice research and development center,in eastern Shandong Province, the new tests almost cover all major types of saline-alkali soil in China. The six testing bases are located across Xinjiang Uygur Autonomous Region and the provinces of Heilongjiang, Shandong, Zhejiang, and Shaanxi.”The tests will examine the performance, yield, taste, and cost of saline-alkali tolerant rice on different types of saline soil,” said Zhang.A section of land at each testing base will be used for soil amelioration using a technique created by the Qingdao center. It is expected to transform the saline land into arable land within two to three years.Yuan Longping, China’s “Father of Hybrid Rice” who helped found the Qingdao center, said that if 100 million mu (6.7 million hectares) of saline land can be used to grow saline-alkali tolerant rice, the country could produce an extra of 30 billion kg of rice if production per mu reaches 300 kg.On Monday, the center also announced the completion of yield test of its first batch of drought-resistant rice varieties in Dubai. The rice breed can produce more than 500 kg per mu. 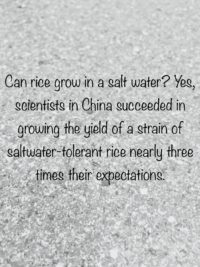 Could you even imagine if we can develop rice that grows in salt water even?